We know how to get even your shy guests out of their seats and onto the dance floor. According to the Bridal magazines the entertainment you hire is responsible for 80% of the success or failure of your reception. Whether it was in Orlando or not think about the last wedding you attended. What did you have to eat? What color were the flowers? What did the room look like? Do you remember all the details? Probably not. Now ask yourself this, did you have a good time? How much do you think the entertainment or more specifically, the DJ, contributed to the success or failure of that wedding? What is that worth to you? Once the vows are exchanged and your photo session is done, your job is quite simple: Have a good time, relax, and enjoy yourself along with the rest of your guests! 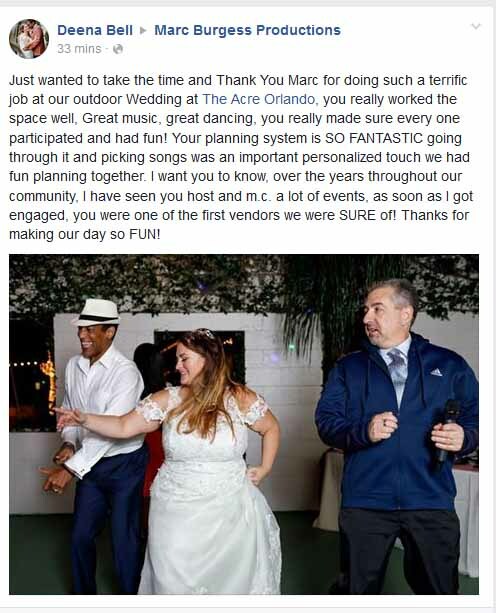 When the professionals from Marc Burgess Productions are on the job, your DJ will coordinate all of the activities throughout the reception with your photographer, videographer, caterer, and of course, you!